Seoul will take its first step toward the world’s blockchain hub beyond Asia. 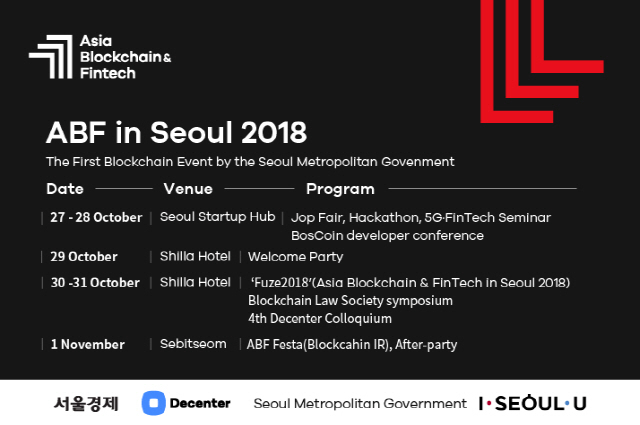 The Seoul Municipal Government will hold various blockchain events including job fairs, hackathons, seminars on fintech and 5G and developer meet-ups in an effort to create the Seoul Startup Hub in Mapo as the base for blockchain and fintech companies. The ABF in Seoul 2018 will be a ‘festival for all’ to be held under the theme “Seeing Future in Blockchain” during which blockchain companies, engineers and students in Asia - which is emerging as the center of the blockchain industry - especially those from Korea, Japan and China, the three blockchain powerhouses, gather. 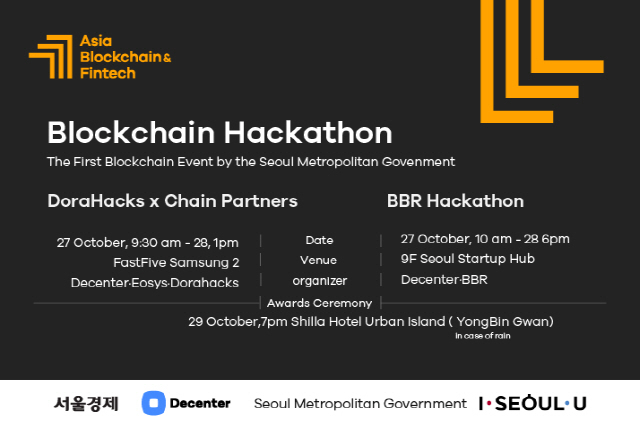 On Oct. 27-28, the last weekend of October, there will be such events as blockchain and fintech fairs, hackathons, seminars on 5G and fintech and BOScoin developer meet-ups at the Seoul Startup Hub in Mapo. 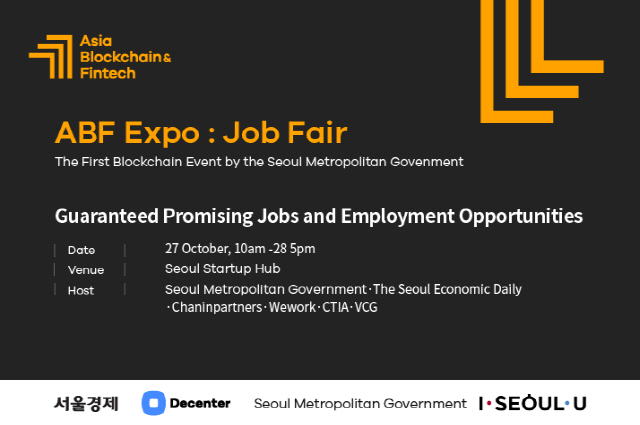 Job fairs will help resolve the problem of information asymmetry between companies in blockchain, fintech and IT looking for talented persons and competent jobseekers and provide Korea’s talent with opportunities to go abroad thanks to the presence of foreign companies from Japan and China in the job fair. These job fairs will be conducted in the form of matching programs for which companies and jobseekers are obliged to apply in advance. This is intended to effectively boost employment by carrying out one-on-one match-ups and interviews based on corporate job information and resumes, instead of a perfunctory recruiting event. During the Oct. 27-28 period, two hackathons will also be held in the presence of more than 400 programmers from around the world. Seminars are scheduled for Oct. 27 to introduce the technical trends on blockchain-based 5G and fintech at the auditorium on the 10th floor of the Seoul Startup Hub. BOScoin, the first Korean company ever to have conducted an initial coin offering, will team up with ARIST researchers to organize meet-ups on Oct. 28. On Sept. 29 in the evening , an awards ceremony for hackathons and a welcome party for the ABF’s main events will take place in the presence of main blockchain figures. 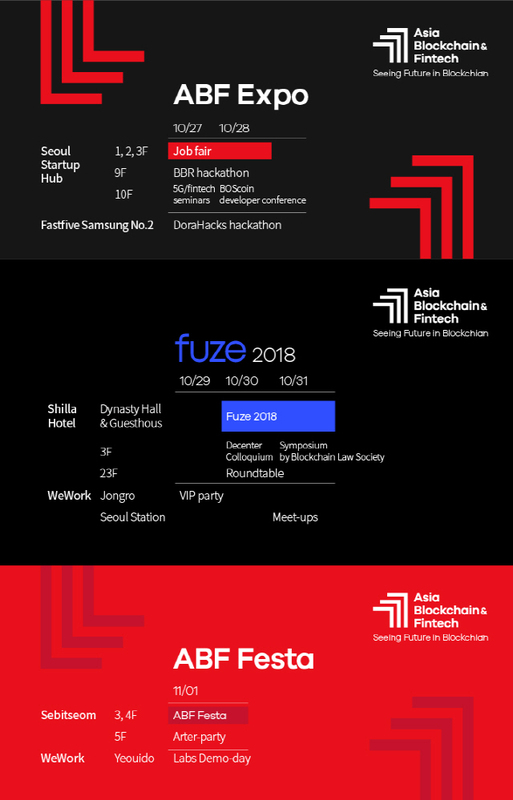 On Oct. 30-31, there will be hot debate on how traditional industries and blockchain technology open the new world at Shilla Hotel under the theme “Fuze 2018: Two Worlds Meet.” Seoul Mayor Park Won-soon, government officials at home and abroad, corporate CEOs and blockchain experts will discuss how blockchain and blockchain-based fintech and 5G will change the world. In particular, blockchain specialists from Japan and China will be present in the ABF in person to show how the two countries’ blockchain industries are developing. There will also be roundtable meetings to enable participants to meet blockchain specialists in small groups and appreciate their insights and professional advice. In these meetings, participants can meet the CEOs of CTIA and VCG, Japan’s leading blockchain accelerators that nurtured Centrality, Proxeus, Performance Lab, SingleSource, Sylo and Pl·g, and have questions and answers on the status of Japan’s blockchain industry and entry strategy. The fourth Decenter Colloquium will take place at 6 p.m. on Oct. 30 under the theme “Blockchain project, can it be successful or not?” and the Blockchain Law Society will hold a symposium to study the enactment of the blockchain basic law. 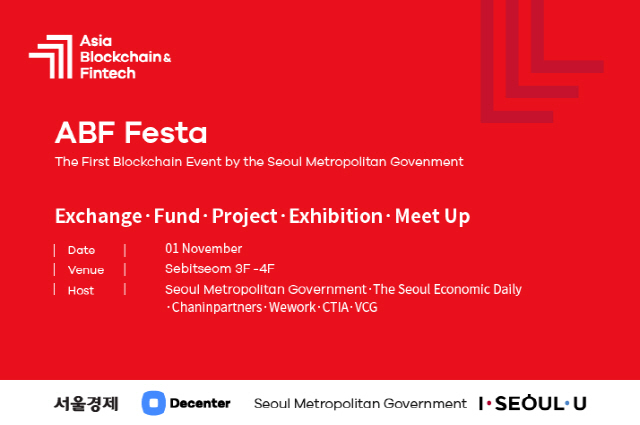 On Nov. 1, the last day of the ABF in Seoul, the ABF Festa will be featured at Sebitseom near Han River to enable blockchain projects from the world over including Korea, Japan and China to introduce their technologies and the new worlds they dream of. All these events are often interrupted by “Blockchain meets Music” shows during which new artists sing their dreams in cooperation with SeeSo, a content platform for upcoming stars. In addition, venues for various independent events such as developer conferences, meet-ups, recruitment-related events and corporate visit programs will be offered free of charge to encourage all to join the ABF in Seoul.